There are many ways for tax payments such as direct debiting, payroll deduction from your employer, credit card or debit card, online payment agreement, EFTPS and check/money order system, to pay your taxes to IRS. 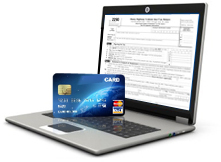 Let’s see the payment options while you choose to e-file Form 2290. You can authorize direct debiting of your tax money from IRS if you are filing your Form 2290 electronically. Visit IRS e-file help for more information on tax payments while e-filing form2290. Tax payments through Electronic funds withdrawal system cannot be done after closing your return or form 2290. Penalty or interest can be added along your balance due. So, please check your account info before making a payment. To withdraw tax payments, you can contact the U.S Treasury Financial Agent through 1-888-353-4537 within two business days of settling your tax. Before you start using EFTPS to pay your taxes to IRS, you should enroll yourself in EFTPS. You can also reach them at 1-800-555-4477 for 24/7 support. Please do not include your payment voucher while you pay using EFTPS. To clear your EFTPS tax payments on time, you have to set it off the transaction at least before 1 business day from the due date for payment. If you are paying through cash or money order, then you should also have to fill on the payment voucher. Do not send cash to the IRS. Never forget to write your name, address, EIN, Date on your payment. Detach payment voucher and you can send it with Form2290. Don’t staple your voucher or Form2290 with tax payments. Tax2290.com offers you secured IRS payments along with E-filing. The provision of Electronic Funds Withdrawal is available with us that enable direct debiting of tax money from your account when you file electronically. Thus, you are opting a safe and secured EFTPS when you E-file and pay our authorized E-file providers.